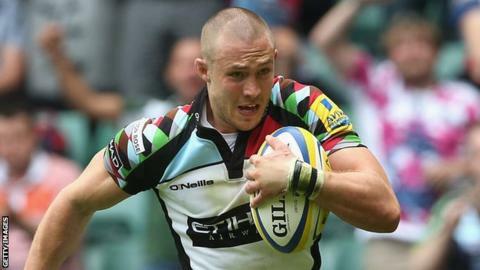 Harlequins full-back Mike Brown says the side have much to improve on despite winning their first game of the season against London Wasps. The defending Premiership champions were 40-13 down early in the second half but rallied to win 42-40. He told BBC London 94.9: "Individually and as a team, that was pretty dire. "We have massive standards and expectations of ourselves and those weren't met. We won in the end but we've got a lot to work on." The England international, 27 on Tuesday, believes the confidence the Quins squad have in their own ability played a large part in their comeback. "We didn't start very well and up to 60 minutes were were pretty flat, didn't get our game going and our defence was non-existent," he added. "We have got a massive belief in this squad, which showed in the end. "We knew once we got a game going we could really push the scoreline. "All credit to Wasps. They were awesome. If they play like that for the rest of the season, they'll definitely be pushing hard for the top spots."